Looking down Milford Sound / Piopiotahi from near head. Sinbad Gully and Mitre Peak (1683m) left, The Lion (1302m), Mount Pembroke (2015m) centre, and Harrison Cove, Mills Peak and Mt Grave right. 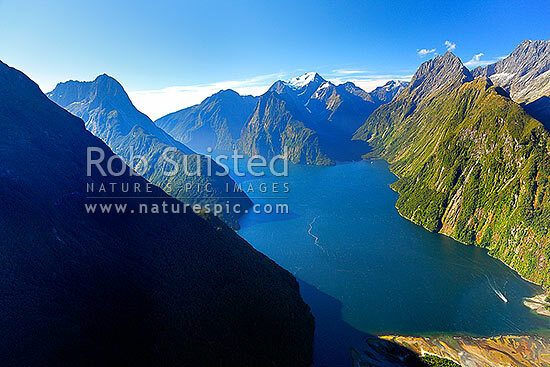 Aerial, Milford Sound, Fiordland National Park, Southland District, Southland Region, New Zealand (NZ), stock photo.